Dr. Mego graduated from Washington and Jefferson College in his native Pennsylvania before getting his M.D. from Harvard Medical School. He completed his Internal Medicine Residency and Cardiology Fellowship at Brooke Army Medical Center before completing his Fellowship in Interventional Cardiology at the University of Texas in San Antonio. During his training, Dr. Mego served as Chief of Residents and earned the Commander’s Award for Outstanding Fellow Teacher. As a staff cardiologist, he held several positions at Brooke including Director of the Cardiac Transplant Program, Director of Echocardiography, and Director of the Cardiac Catheterization Laboratories. He is Board Certified in Internal Medicine, Cardiovascular Disease and Interventional Cardiology. 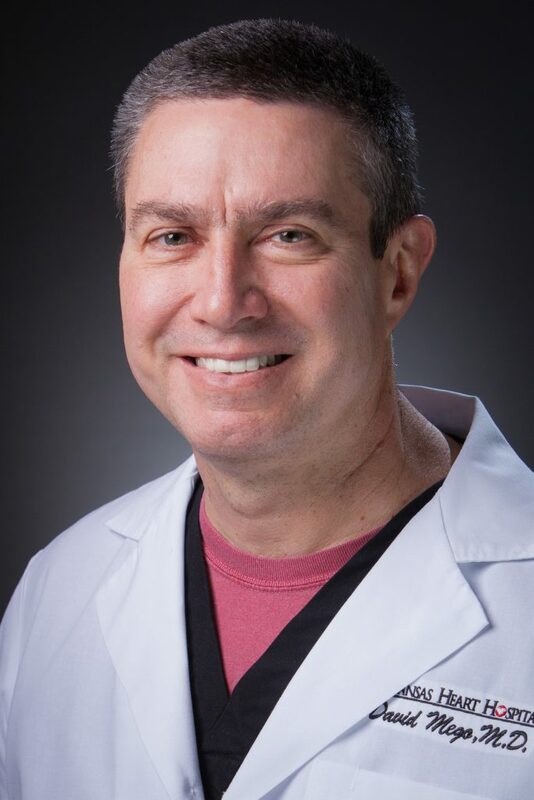 Now a partner at Arkansas Heart Hospital Clinic and Assistant Medical Director at Arkansas Heart Hospital, he is a Fellow of the American College of Physicians, the American College of Cardiology and the Society of Cardiac Angiography and Interventions. Dr. Mego remains dedicated to continuing medical education and to clinical research, and his work has appeared in numerous publications.